Oh dear, we are already on new topic this week? Crazy deadlines were looming last week, so this topic were put on hold for more than a week! I love the X-Men in the 80's. That's when I was introduced to the world of American comics, and X-men will always be my personal favorite. I love most X-Men characters in the 80s because they all had distinctive styles, especially the women. 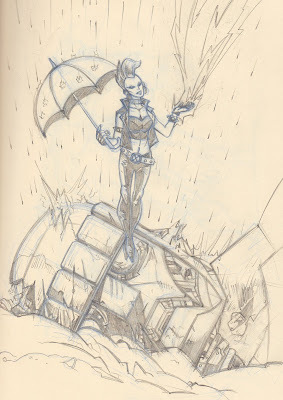 Big hairdo, high waist jeans, loop ear rings, etc... and among all, Storm had a mohawk in a punk goth outfit! how cool was that?! So here is my take on Storm in the 80's... pencil on Moleskine. Next, Powergirl is gonna kick another fellow Kryptonian's face!